This is a close to a "magic potion" as I have encountered, so it is worth a listen. Buddhism, at least the Tibetan form, has a number of very unique concepts that are not always that easy to grasp for westerners because they are new to our way of thinking. In my experience the concept of the Two Accumulations, "Merit and Awareness," is perhaps the most important of the bunch. It is very much worth the time it takes to grasp -- invaluable. Not wanting to push the mathematical term too far, merit and awareness are the reciprocal of one another in the sense that they are inversely related in a push me, pull you fashion. And they function recursively in that they repeat their interaction indefinitely, like the proverbial perpetual-motion machine. I will try to explain. Once I understood how these two much-used terms worked with one another, it changed how I approached my dharma practice forever. So, at the risk of being redundant I will try to describe how merit and awareness work together seamlessly. If you can take the time to fully realize this concept and integrate it into your life, the benefits are infinite. 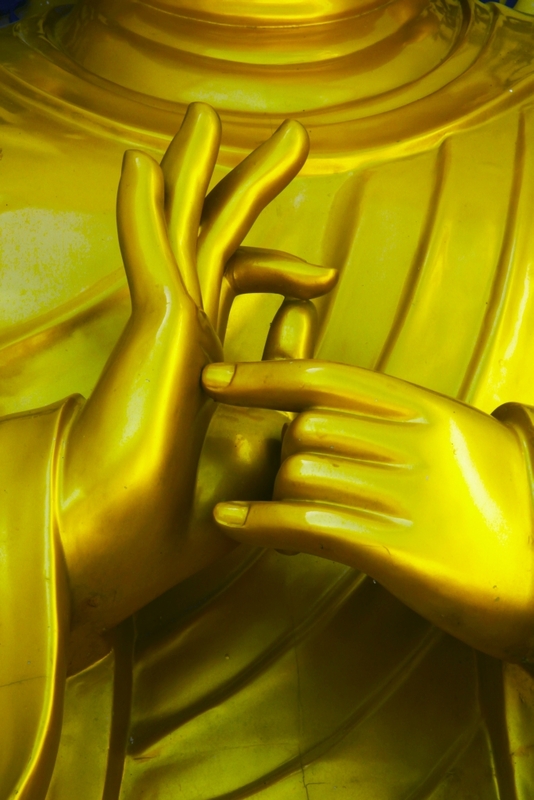 This pair is commonly known as "Merit and Awareness," but also sometimes called "Skillful-Means and Wisdom," and the alternate translations may help to clarify what we are referring to here. Merit is the same as skillful-means and awareness is the same as wisdom. Keep in mind that enlightenment or full awareness is the final result of the dharma teachings that the Buddha pointed out. The concept of the Two Accumulations speaks to how awareness is generated. "Merit" is a term that may not mean that much to many of us, so perhaps the translation "skillful-means" makes more immediate sense. And perhaps no group points out the virtues of skillful-means better than the Zen Buddhists. Being skillful in our every action, executing things skillfully or perfectly, without effort and without damaging anything, is a virtue. It requires skillful-means and creates the best karma. There are all kinds of books like "Zen and the Art of Motorcycle Maintenance" (and other titles) that point to exercising skillful-means, not just sitting on the cushion, but in every moment we live and in everything we do. Ultimately one day we each will have to do this. In Tibetan Buddhism skill-full means in our dharma practice is meritorious. Pure and perfect action of any kind creates a kind of sacred space around itself, call it an aura or just the patina of excellence – pristine. Witness any great craftsman, like a fine instrument maker. Their mandolin or guitar stands out from the crowd because of the exquisite craftsmanship involved. Every action was near-to-perfect and the resulting finished instrument shines with a kind of authentic ambiance that can't be faked. And something made perfectly lasts perfectly, surrounded by its own special sense of space. It glows perfection. This works with people too. And it is the same way with our dharma practice. We can rattle through it by rote, biding our time until practice is over, or we can execute each moment with heart and build a habit that in time will become automatic, creating awareness. In other words, every action we make creates a space surrounding it that is appropriate to the skill of the action, a unique aura and room to rest in – living room. As mentioned earlier, the Zen Buddhists, perhaps most successfully,¬ point this out by imbuing their every action throughout the day with mindfulness (skillful-means), which creates a corresponding awareness in which to rest, the perfect place to be. Awareness (and eventually enlightenment itself) is the product of skillfull-means. The greater our awareness of the moment, the better we can see to act even more skillfully. And more skillful action generates ever more awareness and a chain reaction is set off within our practice. The greater the awareness, the more skillful the action can be, which action in turn creates more space and more awareness, ad infinitum. After a while this recursive reciprocation, each fueling the other to greater moment, becomes incandescent until we can begin to see through the obscurations and attachments of the self and into the true nature of the mind itself. Then we really are waking up. Awareness begets more skillful-means begets greater awareness, and on and on. In brief, skillful or meritorious action generates awareness or wisdom and we rest in that. We dedicate (or offer) whatever meritorious action we can manage that it might benefit all sentient beings, just like on a perfect summer day we might wish that all sentient beings could experience what we are experiencing. We offer it and most of all we then rest in that awareness. In my experience, this is a dharma engine that runs on the two cylinders, merit & awareness, which once started, eventually reaches light-speed and hastens our awakening, and it works. This is one dharma practice that I have personally done and I can testify to its integrity and expediency. Think it through for yourself and test it out. If you understand and feel affinity for this concept, feel free to ask questions.